Piggy is a five-month-old male Shepherd/Pyrenees/Pit mix boy who is a beautiful brindle and white. He is a very laid back pup, great with other children, dogs and cats, loves to play with the toys and is very friendly and social. Piggy will make you laugh out loud with all of his antics. He'll be in the 45-50 pound range when fully grown. Our normal adoption fees are $100 for dogs and $50 for cats under one-year-old; cats over one-year-old can be adopted by approved adopters for a fee of their choosing. This adoption fee completely covers the mandatory spay or neuter, basic immunizations, de-worming, microchip, heartworm check for dogs, rabies vaccination if old enough, free health exam with your participating veterinarian. 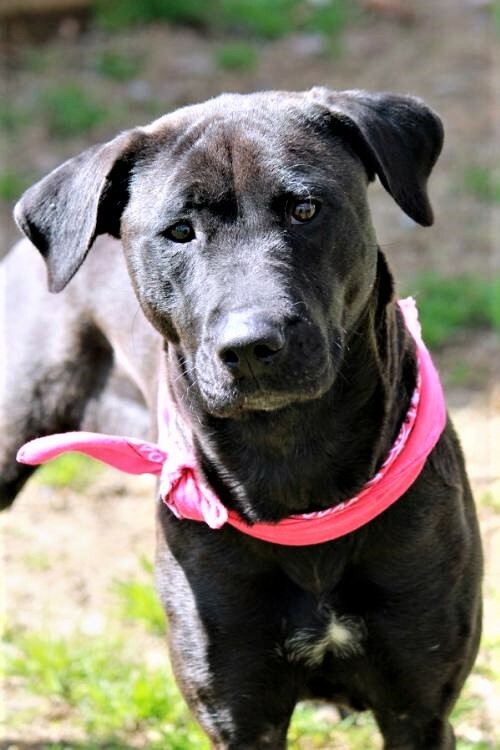 To meet all the great pets at our shelter come to 255 Central Plank Road, Wetumpka, AL, 36092, go to our website at www.elmorehumane.com for more information, e-mail us at hselco@bellsouth.net or give us a call at 334-567-3377. We are open for adoptions Mon–Wed 10-5, Thu 10-12 and Sat 9-3.